If you play any racing games you’ll have been subject to a number of tricks designed to simulate velocity: motion blur, camera shakes, cut sound, shifts in field-of-view - anything to make you feel the speed. Once you pop Rift or Vive goggles on, however, it turns out those tricks are no longer necessary. 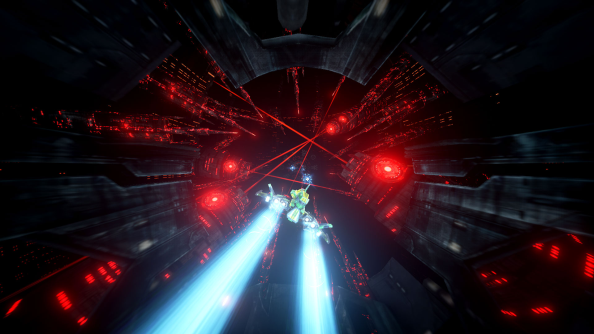 The Collider 2 is about flying a spaceship through tiny tunnels, narrowly dodging obstacles and laser death traps. It’s that bit when you got bored with Flight Simulator and flew far too close to the ground in search of near-death thrills, reimagined as a 54 mission game. There was a Collider 1 which did largely the same thing, but in an abstract setting more reminiscent of Super Hexagon. Which is what Shortbreak - a “separate, independent” studio within Techland - did. They built a hypnotic game in which you hurtled in first-person through brightly coloured tubes that could be particle accelerator, artery, or anything you liked. 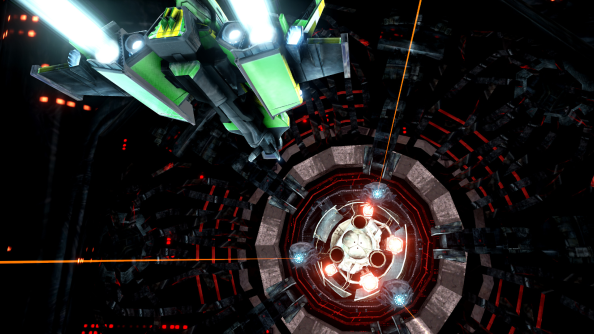 The Collider 1 garnered ‘Very Positive’ user reviews on Steam. But once the team began experimenting with headsets for the sequel, they decided to cast that abstract foundation aside. So we’re not simply whizzing through cylinders anymore, but directing starfighters to take down reactors and collect sensitive data from within the vents of an enemy vessel - eventually destroying a ginormous mothership hovering above our home planet. Although nobody at Shortbreak will be offended if you say ‘Death Star’ instead. Isn’t flying through a cramped space in VR a recipe for instant nausea? Apparently not. Shortbreak have opted for a control scheme that translates head movement into direction, with no “artificial limits or smoothing”. In the studio’s experience, simulation sickness isn’t caused so much by speed as acceleration. As long as they didn’t put their foot down too often, they were free to crank up the velocity as high as they liked without putting their testers out of action. The job of a VR developer, the programmer reckons, is to make sure all the sensations flying at the player’s face match their sense of balance. Shortbreak were able to prototype quickly in Unreal Engine 4, where support for the Rift and Vive saved the team “weeks, if not months” in implementation. Less than two years after The Collider 1, they’re enjoying another ‘Positive’ response on Steam. 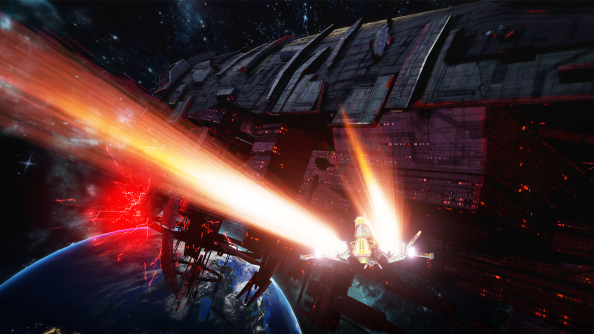 The Collider 2 is available on Steam. Editor's Note: PCGamesN selects fantastic Unreal Engine games and interviews developers of their choosing for the long-running "Making It in Unreal" series. Epic has no influence on the editorial process.